I was not able to attend the first Rock pre-season game at the TRAC this year, but I did manage to make the second on Saturday night. I’ve seen a number of pre-season games in the last few years, and in most of them, you see a lot of players in one half but not the other as the coaches shuffle the lineup in order to see as many guys out there as they can. This one was odd because the Mammoth did that but the Rock did not. Colorado listed 29 runners and three goalies and all but about two or three of them played. The Rock listed 25 runners and two goalies but they had about six guys that didn’t play. For the Mammoth, neither Dan Coates nor Stephen Keogh played at all. I saw Keogh in the building (can’t miss that ‘stache) but I wouldn’t know Coates if I fell over him so I don’t know if he was there or not. I tried to keep track of who played in which half and I also have Jeremy Bosher not playing at all but I may have just missed him. Goalie Brandon Humphrey was there during the warmup but did not play. I counted about nine guys that played only the first half, including Benesch, Noble, Self, Carnegie, Hope, and Ruest. A few guys only played the second half: Sullivan, Triolo, Wardle, Perroni, Kelly, Laprade, Steven Lee, Armstrong, and Fairall. Dillon Ward played the first half while Steve Fryer was between the pipes for the second. On the Rock side of things, I only noticed a couple of guys who was there in the first half and not the second: AJ Kluck and Sheldon Burns were there in the first half but I didn’t see them in the second, while I saw Adam Jay and Mitchell Gustavsen in the second half but not the first. No Brock Sorensen or Jordan Magnuson at all, and a few rookies didn’t play at all either. Nick Rose played the whole game in net while Riley Hutchcraft rode the pine. I wonder if the benches at the TRAC are actually made of pine? Maybe Hutchcraft rode the poplar or the oak or the mahogany (probably not, too expensive). Maybe he rode the MDF. But I digress. I found this a pretty entertaining game, without a lot of the missed or dropped passes and shots that miss the net by five feet that you sometimes see in pre-season games. In fact, some of the Rock passing on a power play in the third was pretty sweet. 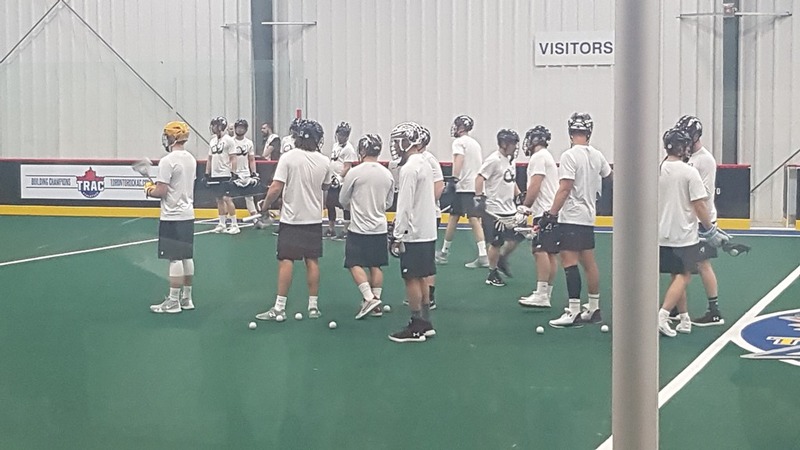 Other than the big personnel changes for the Mammoth in the second half, it looked mostly like a normal NLL game – there were even penalties and a fight. Oddly, both of the fighters, Toronto’s Billy Hostrawser and Colorado’s Steven Lee, were tossed from the game. Neither was given a game misconduct (at least none was announced). No other reason was given for the ejections. This was my first look at Johnny Powless in a Rock uniform, and I thought he played pretty well. He scored one goal but assisted on a couple of others, and one of those assists really stood out. Powless was to the left of Steve Fryer and received a pass from Schreiber. He instantly flipped it over the shoulder to Phil Caputo, all alone in front of the net, who buried it. Great pass, which I’m hoping to see a lot of this season. Powless is actually bigger than I expected. He was 18 when he first joined the league, was the youngest player in the NLL for three straight seasons, and is sometimes still known as the Pup. Perhaps all of those facts made me believe he was small as well as young, but he’s a solid 5’11” and 185 pounds, and looked bigger than that. The final was Rock 13, Mammoth 11. Rock goals were scored by Hellyer (1), Jones (1), Powless (1), Caputo (2), Rogers (1), Craig (1), Schreiber (3), and Lintner (3). Rogers’s goal was a bullet of a shot that went over Dillon Ward’s right shoulder. Schreiber continues to be the hardest working guy on the floor though Dan Lintner works his tail off as well. Adam Jones was ragging the ball while killing a penalty and fought off two Mammoth defenders who were pounding on him. He got away, kept the ball, and even got a shot off. Very nice. Mammoth goals were scored by Stuart (2), Ryan Lee (2), Ruest (1), Noble (1), McLaughlin (3), Armstrong (1), and Fairall (1). Ryan Benesch didn’t score any but got a lot of playing time in the first half and looked in command. So that’s it for the Rock’s pre-season schedule. The Mammoth head to Buffalo on Sunday the 9th for a matchup with the Black Wolves. The regular season starts in less than a week, folks. This entry was posted in Colorado Mammoth, Game Review, Toronto Rock. Bookmark the permalink.